Realtime Gaming is pleased to reveal the new, Wild West-inspired Trigger Happy slots game from Slots of Vegas! Trigger Happy is a 5-reel slot with 30 fixed paylines and opportunities to pick up some incredible rewards on every spin! Players will have to cow-punch and side-saddle their way through the dusty, barren countryside, where only courage, skill, and determination will suffice. As you ride into the sunset with your trusty, charming female sidekicks, you’ll accumulate everything from free spins, free games and a heap of lucky bonus material – all of which will inch you ever so closer to that enchanting progressive jackpot, and a mighty 1,000x the bet per line! Are you ready to help the Sheriff and his cowgirls restore order to the homelands, and overcome the evil crooks and bandits that lie in the way of the legendary treasure? If that’s a yes, then saddle up, tighten those boots and get ready to get Trigger Happy in the new slot game with a true Western twist! In this cowboy and Western-themed slots game, you’ll discover the most exciting prizes and rewards! The Sheriff Badge acts as the scatter, while both the Blonde Cowgirl and Redhead Cowgirl act as the substitutes, which replace all symbols in the game except the scatters. All symbols play left to right and a progressive jackpot awaits you along with a plethora of other lucky prizes! 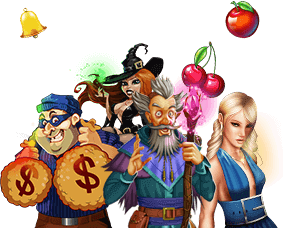 As you ride through your adventure, you’ll be bombarded with free games, free spins and bonus material for aiding you in reaching that ultimate reward of 1,000x the bet per line! Grab the reins and get started with Trigger Happy today! This remarkable, action-filled, 5-reel slots game can be played online for free, as well as for real money! Sign up with a $30+ deposit and receive a 240% No Max Cashout Bonus and 40 Free Spins or a 260% No Max Cashout Bonus for a $50+ deposit and 50 Free Spins! Simply use the code TRIGGERWIN. Sheriff Badge triggers 7 free games. Free games can be retriggered at any given time. Top award is 1,000x the total bet. Once you’ve loaded the game, simply decide your wager amount by clicking the + and - symbols at the bottom of the game screen. Once you’ve set your bet amount, click Spin. We advise betting maximum coins to get the highest potential payout. It won’t take long before you advance through the levels and start accumulating those much-desired free games, spins and lucky features. If you find yourself getting a bit worn out from spinning the reels manually, simply click the Autoplay feature to get the machine to spin for you! Sit back, relax and watch those mighty wins come in all by themselves! Trigger Happy is a 5-reel slot game with 30 fixed paylines. There are huge prizes to be won throughout, including a progressive jackpot and 1,000x bet per line as the top reward! Play Trigger Happy on your PC, Mac or mobile device today.